I always put out a few light bites with cocktails on Thanksgiving one hour before we sit down to the big meal. The challenge is finding things that won’t make people full, but are just enough to tide us over to dinner time, especially if we skipped lunch. Plus, if you’re having an alcoholic drink, it’s a good idea to consumer some food at the same time. Last year I put together a small cheese board to go along with the crunchy cauliflower that my husband REFUSES to let me take off the menu. I also make a zucchini cheese tart which has become tradition and I can’t take that off the menu either. 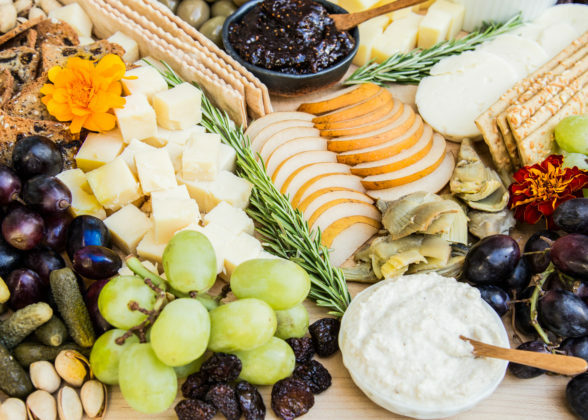 But a cheeseboard is so easy to put together and can provide something for everyone. 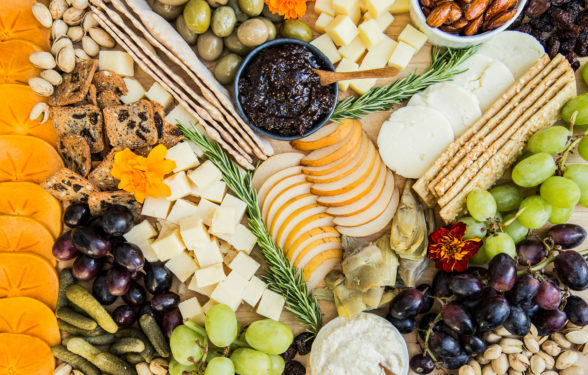 Your local market (like GROW in Manhattan Beach where I live), Whole Foods, Trader Joe’s and Thrive Market all have a wide variety of great cheeses and tasty bites. 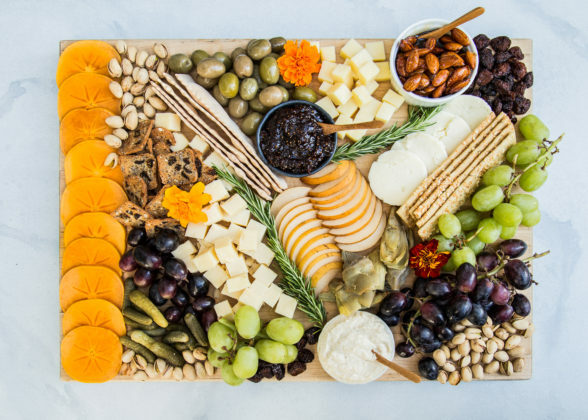 Since my husband doesn’t eat pork and I only like a little prosciutto once in a blue moon, I skip the charcuterie and stick with cheeses (dairy and non-dairy), fresh and dried fruit, vegetables, crackers and bread, dips and spreads, nuts, olives and other pickled things. In this board shown here, I choose to use persimmons (on the left), salted pistachios, fig and olive crisps (Trader Joe’s), grapes, cornichons and olives, Organic Pastures raw cheddar, Divina sour cherry spread (I buy on thrivemarket.com), honey almonds, roasted artichoke hearts (click here for a recipe that shows you how to roast them), garlic paste (purchased in France), Asian pear, edible flowers, Rustic Bakery crackers, and some fresh rosemary sprigs. truffle cheese from Trader Joe’s — everyone freaks out over this. You won’t have leftovers. All of this except the avocado toast can be prepared in advance. I always pull cheese out of the refrigerator an hour ahead. All vegetables can be cut fresh or roasted the day before. As for boards, the one above is a Boos board cutting board, but there are thousands of beautiful boards out there. Bon appetit! My Thanksgiving ebook is now available! This PDF contains all my Thanksgiving recipes, tips and tricks, in one document! You will have everything you need to plan and execute your best Thanksgiving ever. Click here to access the Thanksgiving ebook. « Planning a Happy Thanksgiving 2017 — 1 Week to Go! I’m using this as a model and adding & subtracting a few items. I never knew about those Fuyu persimmons and they add great color. Do the artichokes roast at 400* for 30 min? Thank you and Happy holiday! 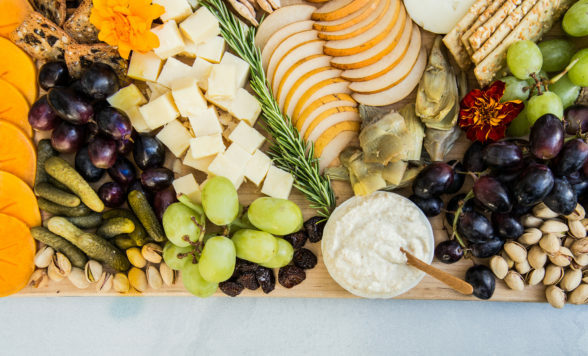 Your cheeseboard is a work of art! Looks absolutely perfect. Thanks for the wonderful suggestion. Lots of great dairy-free cheeses on the market right now, too!